The ground upon which the Commercial Hotel stood was rumored to have been the site of several scalpings in the 1780s. This location on the corner of Cedar and Cherry Streets (now 5th Avenue), is reported as the site of violent clashes between Native Americans and white settlers in the 1780s. At the time, Nashville was not yet a city and the area was still the outpost of Fort Nashborough. 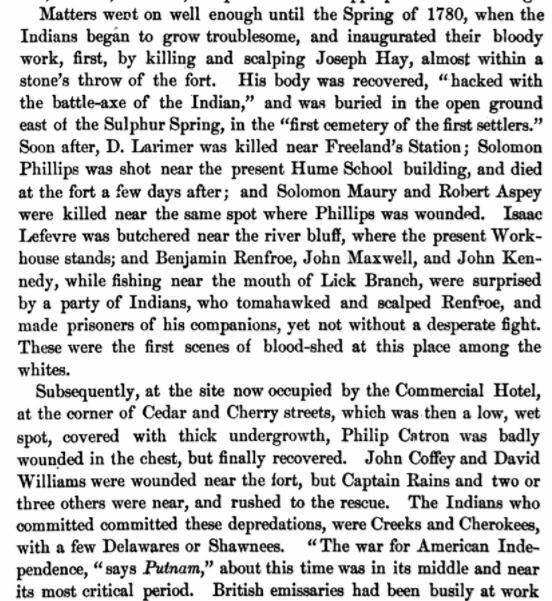 In his 1870 guide to Nashville, Charles Edwin Robert suggested that several men were scalped on the site during the height of tension between Native Americans and Tennessee settlers. Violence was common in the days of Fort Nashborough, perpetrated by both indigenous peoples and white settlers. 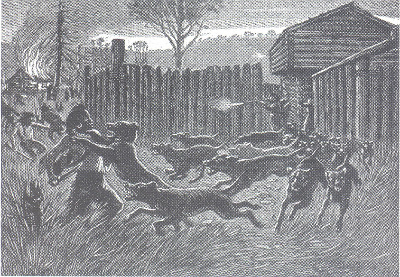 As early as 1779, Revolutionary commanders razed Cherokee towns and killed the inhabitants; other retaliatory attacks for raids were perpetrated against the Creek people. Native Americans in the area were promised protection and respect by agreements like the Treaty of Hopewell, but despite the promises of the developing United States government, settlers continued to push into Native American lands with no deference to the current inhabitants. Therefore, settlers who exited Fort Nashborough risked being shot, scalped, beheaded, or attacked with a hatchet; women and children were not exempt from this fate. The Battle of the Bluff, a deadly battle between settlers and Native Americans, occurred on April 2, 1781, reflecting an escalation in violence between non-native invaders and indigenous Tennesseans. The native peoples of Tennessee faced increasing pressure from incoming settlers, who in turn pressured the American government to secure land for settlers without the presence of indigenous people, pushing out the historic inhabitants of the Nashville area in favor of white American interests. In the days of Fort Nashborough, Native Americans could still inhabit the Southeast, but only 50 years later, in 1830, the Indian Removal Act drove Southeastern tribes out of their homeland, leaving only the ghosts of Fort Nashborough behind. Maia Council, “Indian Raids on 5th Avenue,” Bygone Nashville, accessed April 25, 2019, https://bygone-nashville.mtsu.edu/items/show/4. Intercultural conflict between native Tennesseans and white settlers in the late 18th century. Charles Edwin Robert. Nashville and Her Trade for 1870. Nashville: Roberts & Purvis, Republican Banner Office, 1870. Louise Littleton Davis. Nashville Tales. Pelican Publishing Company, 1981. William R. Reynolds Jr. The Cherokee Struggle to Maintain Identity in the 17th and 18th Centuries. McFarland, 2015. Michael L. Nunnally. American Indian Wars: A Chronology of Confrontations Between Native Peoples and Settlers and the United States Military, 1500s–1901. McFarland, 2010. Published on Nov 29, 2017. Last updated on Dec 8, 2017.